Mare rema rame, or sea rowing copper, is the inspiration for the Italian fashion designer Daniela Gregis‘s Spring/Summer 2018 collection. As a result, the runway show included stripes, netting bags, sunglasses, and wide brimmed sun hats. Bold colors such as red, navy blue, and white combined with the warm bases of cream and straw yellow were familiar to the season. Yet, new hand-painted prints were included—a couple multicolored patterns such as speckles, abstract brush strokes, and even some stripes had a painterly quality. 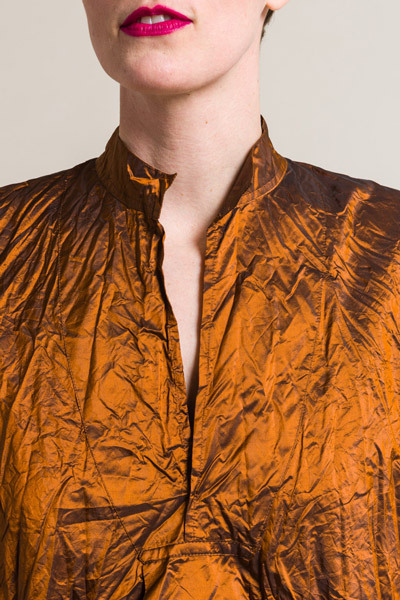 The new pieces from the collection are made from washed silk with a metallic finish. Each being three distinct colors, we have a rust, bronze, and navy blue. As usual, the garments are use with the elegantly oversized and relaxed silhouettes made from luxurious textiles. Beyond shape, the tops are left with a wrinkled texture, which enhances the beauty of texture. In contrast, a navy blue dress features a smooth texture, but with a structured shape that is adjustable, due to its belt. Her voluminous and spacious shapes are always created with the high quality materials such as linen, cotton, and silk. Colors are soulful and the patterns are dynamic. In the end, Daniela Gregis provides the harmonious balance between artful and minimalist. Shop the new collection online or in-store at Santa Fe Dry Goods.